Pleather is a "plastic leather" or synthetic leather. It is available in a variety of weights and forms. 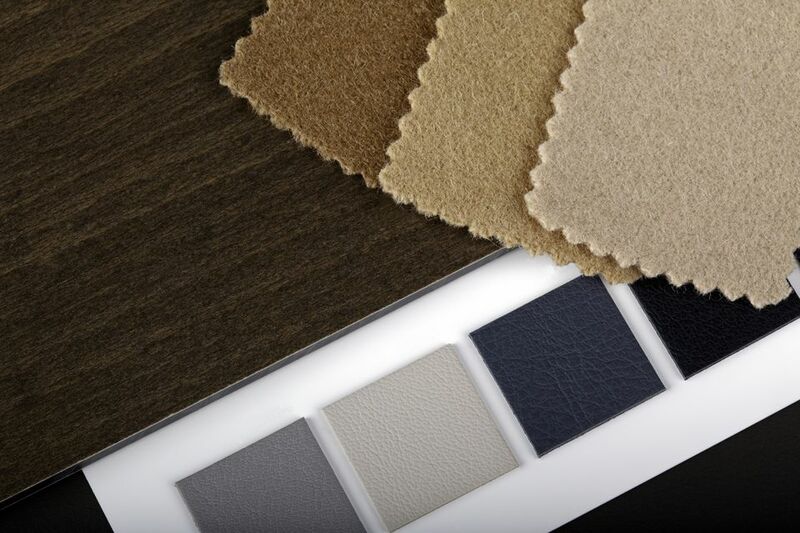 Some forms of pleather have a suede-like surface while others have a smooth finish. Synthetic leather is much more economical than leather and easier to sew than leather. It is also available for larger projects, an advantage over leather where you would need to match hides to get enough fabric. Pins will leave holes, so they must be avoided anywhere that would be visible. Holes can weaken the fabric even if they are in a seam allowance. Rather than use pins, visit the stationery aisle at an office supply store or your local department store. Items such as paper clips, tape, or weights used for fabric work nicely and won't leave holes in the fabric. Use glue stick wherever it won't be seen. Use as little as possible to prevent a sticky mess that could bleed through at seams to the visible side of the fabric. If pinning is absolutely necessary, pin in the seam allowances and remove the pins as you sew. Skipped stitches are the result of the fabric not feeding through the sewing machine properly. A leather sewing machine needle may solve an issue with skipped stitches. A roller foot, a Teflon foot, or transparent tape on the bottom of your regular sewing machine foot will also help allow the fabric to move properly. Experiment with different presser feet on scraps of the pleather fabric. Sew from the fabric (wrong side) whenever possible. If you must sew on the right side, place tissue paper on top of the fabric to help the machine feed the fabric properly. Do not use a high-temperature iron. Use a dry iron set on the synthetic setting and test the setting on scraps of fabric before your project. Use a press cloth on both the right and the wrong side of pleather to prevent the iron from melting the fabric, sticking to the fabric, or scorching the fabric. It is best to test your iron setup with scraps of the fabric to ensure good results and not ruin your project. Do not use a heavy hand. Work slowly and allow the heat to do the work, not the weight of the iron. Plowing through the fabric with the iron while the fabric is warm, will cause the fabric to become distorted and mis-shaped. Use alternative pressing tools such as a clapper, a wallpaper seam roller or a wooden seam pressing bar to set creases and seams. Not all pleather is washable. Read the bold end information or test a scrap, by measuring a square of the fabric and putting it through the washer and dryer. Once it is laundered, test the feel of the fabric and re-measure the square to test the amount of shrinkage. If you are going to wash the item, preshrink the fabric using the same method you will use on the finished item. Choose a simple project that does not have a lot of top stitching, such as an envelope-back pillow or simple tote bag before you attempt making a hand bag or purse pattern. Practice and test your sewing machine settings on scraps. Remember to use sewing machine troubleshooting by sewing regular fabric before you immediately believe a problem is caused by the fabric. Always refer to your sewing machine manual for information that applies to sewing with your machine.